Over half term we have been doubly blessed with board games. A few days ago we played Splendor, and today it’s the turn of Ticket to Ride. 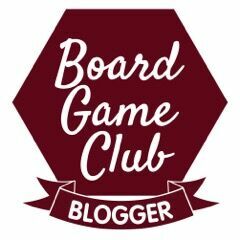 We have these games because we belong to the Asmodee UK Blogger Board Game Club. They send us a game to review every month, and this month, we got two. 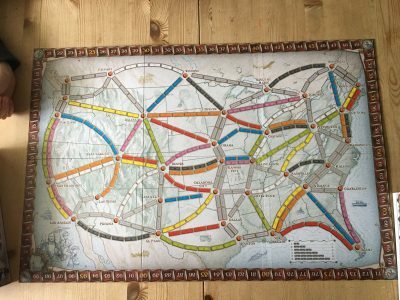 So here is our review of Ticket to Ride. 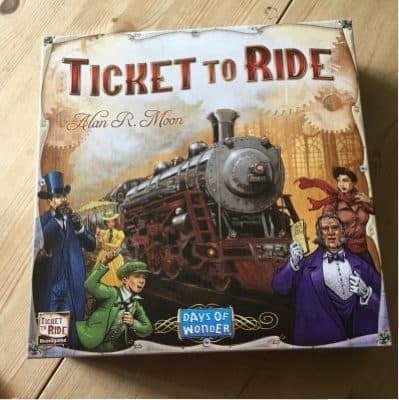 As with all of the games we have reviewed from Asmodee – the packaging is gorgeous and the pieces are all very well made. I thought the playing cards were quite small, but once I realised that you could end up with quite a lot of them in your hand it did make sense. 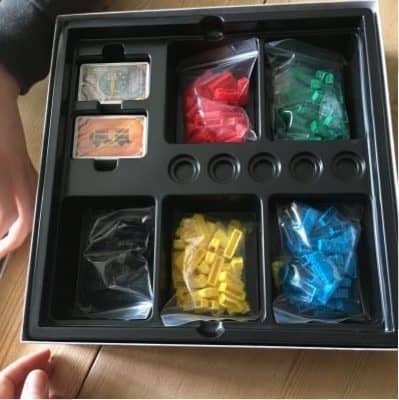 When you start the game you have to shuffle the big pack of cards really well – this is worth doing very carefully as it ruins the gameplay a bit of cards of the same colour are all batched together. The aim of the game is to connect routes between cities with the players competing to build the most routes themselves and to block the other players from completing theirs. The concept is very simple – you collect cards of the same colour in order to build the routes between cities. There are bonus points for completing longer routes between cities which are anything from 4 to 20 squares apart. You get to choose how many of these longer routes you want to try for, but you will lose points at the end for any that you try but do not complete. The game turns are very simple – this game could be played by all ages as it really is quite easy to learn. You do get to discover a small amount about the geography of the map you have chosen, but it’s also fun when players start blocking each other. We played with three players this time, but we will definitely invite Dad to join us and maybe even find a 5th player, because it could be even more fun with more people competing to join the dots on the map. The really fun part is that nobody really knows until the end who has won, as you don’t reveal which longer routes your were trying for until the end. 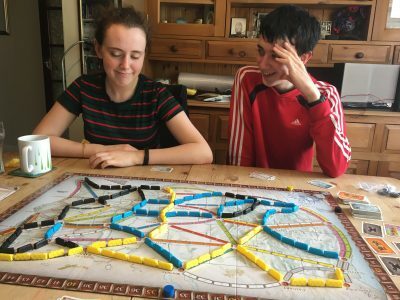 There is a bit of luck involved – in the game we played I had a much better set of routes to aim for and I got them all, so at the end I had an unassailable lead, whereas my children had slightly harder challenges to meet. But we all agreed that it was really good fun and we want to play again. Apparently there is a map of Europe you can get, which adds a few new rules to the basic set – this sounds like lots of fun. And then finally there is a map which has the UK on one side and Pennsylvania on the other side which adds an expansion to either the American map that we have already , or the European map which we will probably get quite soon. I think the game took us about an hour to play but it was fun, fast paced and scope for much conversation and hilarity. We were doing fake American accents as we connected the American towns (which we are pretty rubbish at but that is part of the fun). Everyone was smiling the whole way through and we look forward to playing again. 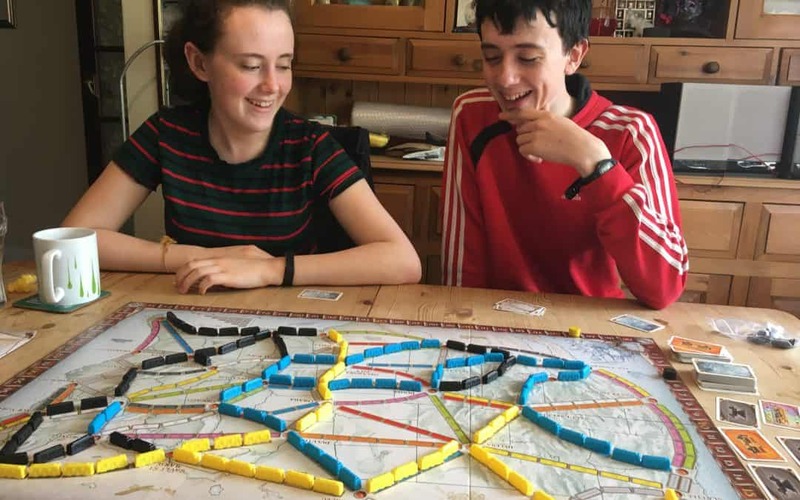 So we would definitely recommend Ticket to Ride for families with up to 5 game players from age 8(ish) upwards. Great fun for all the family!